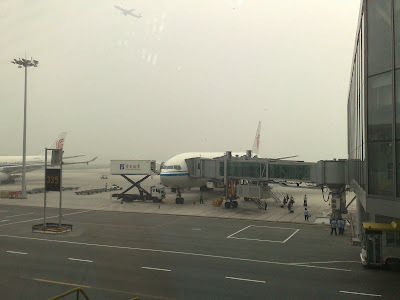 I was on a Air China flight to Beijing recently for a business meeting and half way through the journey we were informed by the captain of the flight that we will not be able to land in Beijing Terminal 3 due to bad weather and had to land at another airport some 200km from the Beijing Capital. I had earlier rescheduled my appointments to a later time due to the delay in taking off and now with the latest announcement, i would probably have to miss all my meetingsfor the day and reschedule them to another day and this would had been my biggest nightmare. Just some 30 minutes before arrival, the captain came back on the speaker to inform us that the airport has been reopened and we can land in Beijing. The descend towards the airport was rough and bumpy and the visibility was very poor. It was hazy and i could hardly see anything from the window of the aircraft until the last few second before the touch down. 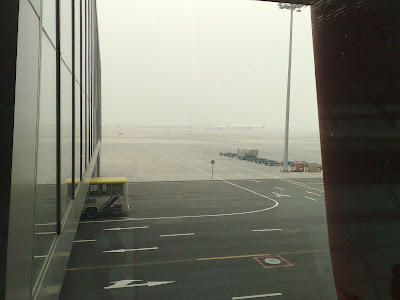 Below are some images taken on arrival and on the way to the Beijing capital. Its clearly not bad weather but a serious problem with pollution. China had been developing at a record breaking pace at the cost of becoming the world's most polluted economy, which kills an estimated half a million of people annually. With Olympics weeks away, we can only pray that the condition improves and the measures taken by the central government are effective enough to reduce pollution level. At current level, some of the events may have to be scrapped. No atheletes will want to do a full marathon in such condition. 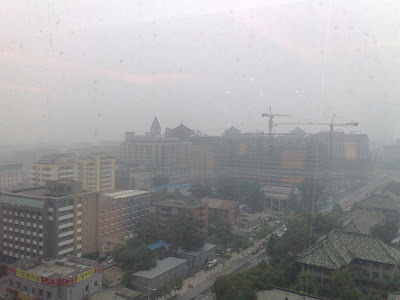 View of central Beijing from the top of an office building. Visibility and air quality is extremely poor. 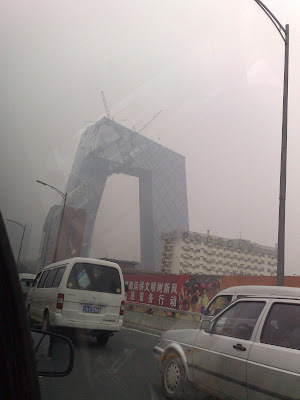 This is the new almost completed China's Broadcast Plaza.